Traditional Bolivian music comes in many forms and rhythms, according to the numerous regions that make up this country. Many people think of Bolivia as an Andean country but actually there are over 30 native Bolivian ethnic groups and each has its own typical Bolivian dances and music. In Latin America, Bolivia is the country that has best preserved its typical dances and music and is often referred to as the folkloric center of the continent. Bolivian musical groups and musicians have kept the traditions and music of Bolivia alive and made it known throughout the world. Participating in, or learning about, Bolivian festivals and holidays is the best way to see Bolivia's music and dances, Bolivian clothing and costumes, and the legends and customs the dances portray. There are so many different Bolivian dances, we’ve divided this into 4 pages. When you finish reading this page on the music of Bolivia's Central and Southern valleys, proceed to page 2 to hear the beautiful music of the Andean music of Western Bolivia's mountains, continue to page 3 with the lively and party-like music of the Eastern Bolivian tropics and plains, and finish on page 4 with the most surprising of all, the centuries-old tradition of baroque music of Bolivia's Jesuit Missions, an ancient European Renaissance music style taught to the indigenous peoples in Bolivia's Chiquitania region and passed down from generation to generation for over 500 years. This rhythm is from the valleys and the highlands where shepherds herded sheep, llamas and alpacas and spent long hours entertaining themselves with their quenas. Later, a dance was created based on the common movements the shepherds and shepherdesses made to herd, watch over, water and feed their herds. This is one of the newer Bolivian dances, and represents the dusk and coming of evening. This lively music is typical to Argentina, Chile, Mexico, Peru and the Bolivian valleys, with variations in each country. 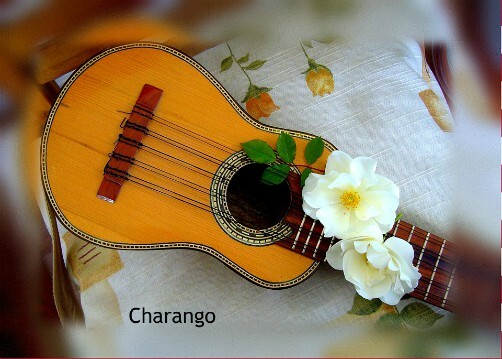 It is played with charangos or guitars (and in many modern variations violins and accordions). This dance, almost in a satirical manner, is a courting dance between men and women. It is known throughout the world and can be identified by the typical twirling of a handkerchief overhead. This is an Inca type of music, common to both the valleys and the highlands as well as Peru. It is the rhythm that spawned the “bailecito”, “carnavalito”, “caluyo”, “rueda” and “cueca” dances. It is played with the quena or zampoña and the charango, but today there some Bolivian musical groups also play it with the accordion, trumpet and saxophone as it is one of the few indigenous dances that became popular among all racial and social classes, from Colonial times through the present. From Chuquisaca, this is danced to the rhythm of the quena flute. It originates from a festivity to celebrate the arrival of spring and the beginning of a good planting season. Also from Chuquisaca, this Bolivian music type is played with wind instruments. It’s a pretty funny rhythm with movements that make observers laugh. It originates from a festivity to thank Mother Earth for providing an abundant supply of water. This dance is similar to the “cueca” and is seen in Cochabamba and Chuquisaca. In involves songs of love and sometimes resentment accompanied by guitar chords. It is danced in pairs. This music is danced in the Altiplano and in the valleys. It has a paused rhythm and uses only drums and cymbals. It originated in a more recent century and is a satire about lawyers (thus the name). Dancers use tailcoats, ties and top hats. This music type varies in each of the three countries that share the Gran Chaco region, which in Bolivia covers portions of three departments (Santa Cruz, Chuquisaca, and Tarija). It is played with the guitar, violin, accordion and bass drums. Bolivian dancers require a lot of flexibility as they do many acrobatic jumps and spins. This traditional Bolivian music type is from Tarija and is played with the “erke” (a very long trumpet made from several lengths of sugar cane joined together, with a bull’s horn at the end) and a “caja”, which is a small hand drum. Sometimes bass drums and guitars are used, but they aren’t traditionally a part of this music. The name (which means “wheel” or “circle”) comes from the manner in which it is danced. Dancers form a circle and hold hands. They then spin in one direction and upon completing the circle, spin back in the other direction. Also from Tarija, this music is actually more of a poem that is sung or put to music. It comes from the traditional “duelos de coplas” folk songs about duels that are sung and danced at the fiestas of the “chapacos”, as people from Tarija are called. One dueler sings his verses and then other must respond, competing to see who can sing the most ingeniously in an attempt to outwit their rival, sometimes with sung insults. It can be accompanied by the “cajas” (small handheld drums), violin or guitar, or may simply be sung. This Bolivian music type originates with the European tradition of the troubadours (minstrels) who settled the region.